« How big should my new practice be…? 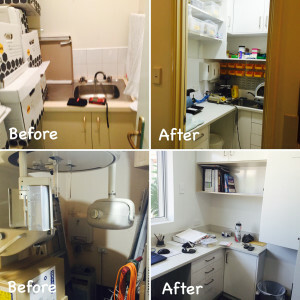 The old lab transformed into a gorgeous, light-filled room…! 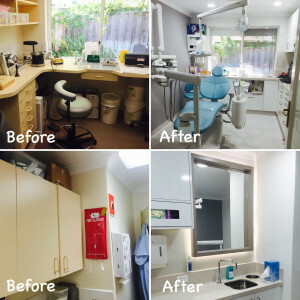 When Dr Jane Connor first contacted us, she was looking at putting in a new hygienist room. The existing lab seemed like the obvious solution, but then, where to put the lab…? She thought maybe it could go into a shipping container outside…? We’ve looked at doing this for other projects (funky, right…? ), but for one reason or another it hasn’t been a successful option. Either the council couldn’t get their head around the idea or it’s taken away precious car parking space. So, as we are really magicians, we made space out of nothing…! What we did is make better use of the space. We’ve done really tiny labs in the past, so we quizzed Jane and her staff on how much room they really needed. In reality, not too much at all. We looked through the practice and found a disused X-ray developing room being used for storage. And it still had a sink – bonus…! We gutted it a created a small, but useable lab…problem solved…! But we still needed storage space…hmmm. We reviewed the rest of the practice and found a windowless alcove being used as an office by Dr Andrew Connor. There was also another room with an ancient OPG which hadn’t been used for years. This room has lovely natural light and we were able to convert it to a small, but useable office with desk space for each doctor. The main cost involved in this was removing the OPG – those things are heavy…! A partition and door enclosed Andrew’s old office to create a great storage room…viola…! All in all, a lovely project where Ego Squared got to do what we do best – make the best use of your space. Would you like us to review how you use the space in your existing practice…? Check out more about our refurbishment packages here or use our contact form to talk to us now…!